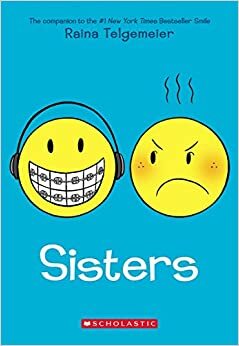 The graphic novel Sisters by Raina Telgemeier is a story about Raina’s relationship with her sister, Amara, when they were growing up. When Raina was a little girl, she always asked her mom and dad for a baby sister to play with. But when Amara came along, it was completely different than what she had in mind. When Amara was about 12 years old, the family planned a reunion with the rest of their family in Colorado. Since they didn’t have the money they needed to buy the plane tickets, they had to drive from San Francisco all the way to Colorado. During the drive, Raina tried her best to ignore Amara. Amara was annoying her the whole drive. At the reunion, Raina felt she couldn’t fit in with her relatives. It turns out Amara was having the same problem. Raina asked her sister “you ever feel like you just don’t fit in?” Amara answered “all the time.” This was the turning point in the story where Amara and Raina actually had something in common and to talk about. Raina Telgemeier writes and illustrates her story about her past relationship with her sister Amara. This non fiction graphic novel is a great example of how you can change your relationship with someone that you have fought with in the past. Raina Telgemeier, as said in many reviews, “uses her signature humor and charm to dazzle the reader”. She sure dazzled me when I read this book. I admire her unique way of writing and expressing her feelings through drawing the story opposed to writing it with words. I strongly recommend you read this fantastic book.